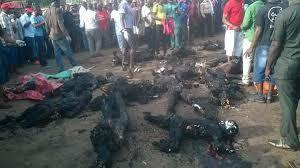 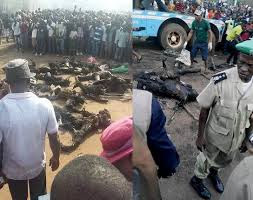 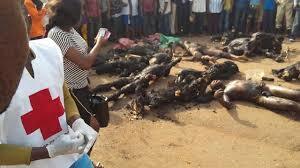 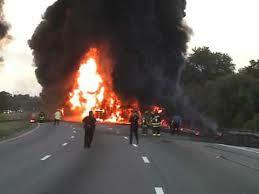 No fewer than 69 persons burnt to death Sunday evening when a trailer loaded with Premium Motor Spirit otherwise known as petrol that was descending from Army barracks side of Onitsha Enugu express way lost control and rammed into the Asaba Motor Park at Upper Iwekas Onitsha and exploded. 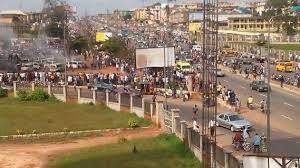 Eleven vehicles mostly commuter buses and two motorcycles inside the Asaba Park Onitsha including the 40 foot tanker laden with petrol burnt beyond repairs inside the park. The Nigerian Red Cross Society officials were the first to arrive at the scene of the incident, and according to its Chairman Prof Peter Emeka Kathy “we have sixty nine burnt to dead persons as at now, there are other 30 casualties, a casualty is a living person, a dead person is no longer a casualty, so 69 persons are dead, and they have bee evaluated to various mortuaries in Onitsha, from Toronto to St Charles Boromneo Mortuaries and others in town”.